Before I invest in an online marketplace lender's stock, I'm going to need to see these questions answered. 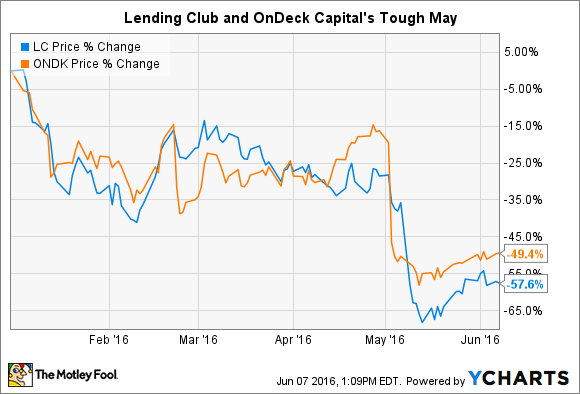 Online marketplace lenders like Lending Club (NYSE:LC) and OnDeck Capital (NYSE:ONDK) have had a tough month. While these companies could still one day upend the banking industry, I have seven big questions that prevent me from investing in their stocks today. Here they are in no particular order. 1. How will they look after the dust settles from Q1? The first quarter was a tough time for both of these companies, featuring wildly volatile stock swings and even a change in the corner office at Lending Club. Lending Club's board of directors elected to fire former-CEO Renaud Laplanche after discovering that dates on a group of sold loans had been altered to match the requirements of a loan investor. The error was immediately corrected and found to be an isolated incident, but the market remained concerned about the the company's review and internal control processes.. The board also learned that Laplanche had a previously undisclosed investment in a related fund that could have been viewed as a conflict of interest. In light of both events, Laplanche and three of his executives were fired. The news sent to the stock spiraling lower. Lending Club stock is down 58% year-to-date and 41% over the past month alone. OnDeck's tough month was driven by a quarterly loss of $0.13 per share, worse than the $0.07 per share loss expected by Wall Street analysts. Revenue missed by 11% and the company lowered its guidance on loan volume this year by 10%. The stock is down 52% year-to-date and 42.5% over the past month. None of these events will be fatal for the companies, but each does raise serious questions about the state of each respective business. To me, those questions make the stocks too much for my risk appetite to handle. I'm going to let the dust settle and see how this all plays out before investing my capital. 2. How wide is their economic moat (or is there one)? Thinking longer term, I'm not sure that any of the market place lenders have a sufficient economic moat to protect their businesses from competitors. There's the risk of new marketplace lenders beating them at their own game, but more significantly, there is the threat of well-capitalized traditional banks entering the market with the full weight of their marketing budgets, branding, and existing infrastructure. Wells Fargo (NYSE:WFC) recently announced it would begin accepting small business loan applications online, a move that could easily be a first step toward becoming a true marketplace competitor. Other traditional banks are certain to follow, even if most have thus far elected to partner with existing marketplace lenders rather than build their own products. In either case, the barriers to entry remain small enough to make me worry about how protected these businesses are. 3. Can Lending Club and OnDeck Capital manage an aggressive regulator? Online lenders face regulatory challenges similar to those of traditional banks, which is to say, major ones. They must comply with an alphabet soup of regulatory agencies governing lending, plus the regulations and securities laws that govern their secondary market loan sales. Traditional banks have the scale to manage their regulatory burdens with large groups of seasoned professionals and cutting-edge technology. More importantly, they have the capital to quickly comply with new and potentially costly changes. For now, it remains unclear whether online marketplace lenders have the staying power and financial strength to manage an onslaught of regulatory scrutiny like the rest of the banking industry has experienced since the financial crisis. It's impossible to know exactly how regulators will approach these lenders over time, but before I invest in their stock, I'd like to have a better idea of exactly how that relationship will play out. 4. Can they lower their crazy high customer acquisition costs? Lending Club's quarterly revenue grew 87.5% from the first quarter of last year to this year. That's an incredible growth rate. However, to achieve that growth the company had to increase its sales and marketing expenses at an even higher pace. In the first quarter of 2016, Lending Club's sales and marketing expenses were 43.7% of its revenue. In the 2015 first quarter, those expenses were 42.4% of revenues. What this means is that the company's sales and marketing efforts are not scaling with revenue. If Lending Club were making heaps of profits at the same time, then this fact wouldn't be an issue to me. However, the company profited just over $4 million in the first quarter. Last year's first quarter resulted in a loss of more than $6 million. The pattern is similar elsewhere in this space. OnDeck Capital's first quarter sales and marketing expense was 52.6% of net revenue, and the company lost over $13 million. That's an increase from the 2015 first quarter's ratio of 44.8% and a $5.3 million loss. These are both clearly cases where the companies are prioritizing growth over profits. That's a tactic that has worked for many other young, aggressively growing companies. However, for my personal risk tolerance, I want to see that these companies can generate sales without the heavy spending in sales and marketing. Until they prove they can lower their customer acquisition costs, I'm going to wait and see. 5. Can they shift their business model to one that's less transactional? One proven method for lowering customer acquisition costs is to build a relationship with consumers. Online marketplace lenders shouldn't underestimate the power of the cross sell. In the 1980s, Wells Fargo encouraged its sales staff to focus on relationship building, epitomized by the bank's "8 Is Great" slogan. This ingrained the bank's goal of selling eight different products to each customer from across all their product lines. By offering a complete suite of financial products -- deposit accounts, loans, insurance, wealth management, and more -- Wells and others are able to solidify their relationship with each client, and increase their revenue without any increase in customer acquisition costs. Land the customer once, and sell them all the products they need. Currently, Lending Club, OnDeck Capital, and the other marketplace lenders rely on transactions to drive revenue, not relationships. To me, that's a major weakness. 6. Can these companies compete given their high cost of funds? The market dictates the interest rate that borrowers are willing to pay. The cost to fund that loan is an expense that must be managed to ensure maximum profits. When you rely on institutional investors to fund your loans, the cost of your capital is going to be high. Today's online lenders report costs of loan funds around or even higher than 5%. Compare that with banks, which have an industry average cost of funding around 0.3-0.4%. To make money on top of that high cost of funds, online marketplaces must either charge higher rates than banks for a loan with a given risk profile, or they must focus on the highest yielding, riskiest borrowers. A bank's low cost of funding give it a big advantage on pricing and risk management over an online marketplace. As a stock investor, that bank's funding model is far more appealing to me. 7. How will they fare when the credit cycle contracts? To me, the biggest question mark is that these companies have yet to do business through a complete credit cycle. OnDeck and Lending Club were both formed in 2007, and each just IPO'd in December 2014. They were infants when the credit crisis hit. They were able to completely sidestep the financial crisis not through improved credit models, but through incredible timing. Today, Lending Club, OnDeck Capital, and others are much more mainstream. Their loan volumes are considerably higher. They are legitimate players in the loan market. One day, the credit cycle will turn once again, and when it does, we simply don't know how these companies and their loan investors will react. Will their loan investors walk away, drying up funding for new loans? Will the investors keep funding loans, accepting higher defaults as a cost of doing business? What if Lending Club begins using its own capital to fund loans, like OnDeck already does? Are they liquid and well-capitalized enough to handle the problems? These companies very well may prove better equipped than banks to manage through the down cycles, but it's impossible for anyone to say that with certainty. Lending is a cyclical business, and those who do it best earn their stripes during the tough times. Until we see how these companies perform through a down cycle, I'm going to remain a skeptic. Could I be wrong about any, or all, of these concerns? Absolutely. Neither I nor anyone else has a crystal ball into the future of marketplace lending. However, based on my own personal risk tolerance, I'm going to stay on the sidelines for now.